Kristaps Ģelzis’ solo exhibition „Bonaqua” is on view at Riga Gallery 1st and 2nd floor from 16 May; seventeen new, large-scale watercolours painted especially for this show are exhibited. Kristaps Ģelzis’ name is related to conceptual ideas realised in provoking, challenging installations, videos, large-scale digital prints or aestheticised, skilfully crafted objects made from velvet, fur, metal, etc. The artist’s turn to watercolour in the latest works is not accidental. 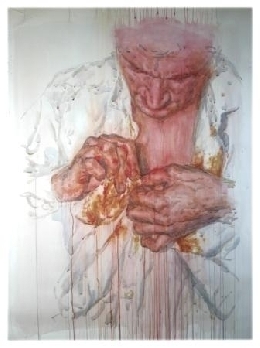 The idea of the show is subjected to this technique, a professional challenge to the artist himself – to demonstrate the watercolour’s scope and power to speak in the language of contemporary art. 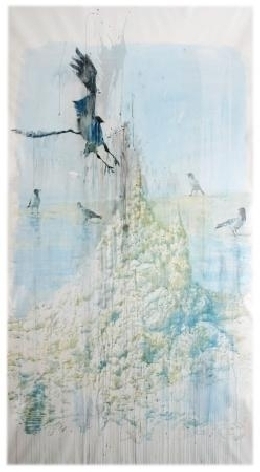 „ Bonaqua” is the artist’s latest solo exhibition after a longer break – Ģelzis’ last solo show „Time Square” was on view at Riga Gallery in 2000. „Three-dimensional” watercolours on the 2nd floor are intended to deal with the issues of ecology. Ģelzis uses his typical ironic approach to focus not only on ecology in the aspect of nature but also on human minds and language contaminated by stereotypes and symbols. 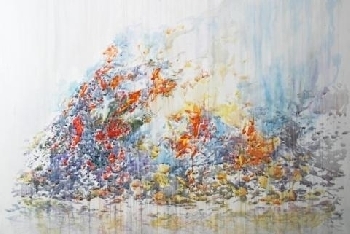 Watercolour as an ecologically pure technique is a thematic means to think about natural, ecological and philosophically marginal questions in this exhibition. Kristaps Ģelzis (b. 1962) together with his contemporaries – inventors of conceptual art – took an active part in shaping Latvian contemporary art since the mid-1980s. He was among the artists whose works were exhibited is such important shows as “Personal Time” in Warsaw and St. Petersburg (1996) and “Riga – Lettische Avantgarde” in Staatliche Kunsthalle in West Berlin (1988). 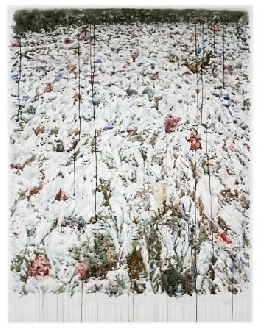 Ģelzis’ solo exhibition “Virtuale” was on view at the State Museum of Art (the present Latvian National Art Museum) in 1996. His works have been exhibited in shows of international scale – in Contemporary Art Museum Kiasma in Helsinki (2004), Riga Gallery exposition at the International Art Fair “Art Moscow” in the Central Artists’ House in Moscow (2001, 2003), exhibition “Contemporary Utopia” (2001) organised by the Latvian Centre for Contemporary Art (2001), Baltic art exhibition “Baltic Security!” in Arlanda Airport, Stockholm (2000), exhibitions in the Bremen City Gallery (2002), Contemporary Art Museum in Budapest (1991), Contemporary Art Museum in Pori (1992), etc. Kristaps Ģelzis’ works are found in the collections of Contemporary Art Museum Kiasma in Helsinki, Latvian National Art Museum, Artists’ Union of Latvia Museum as well as in private collections in Latvia and abroad.